Ghana has become the latest anglophone nation to be admitted to full membership of La Francophonie. The West African nation had been an associate member of the group since the 11th Francophonie Summit in Bucharest on September 28, 2006, bypassing the observer status. 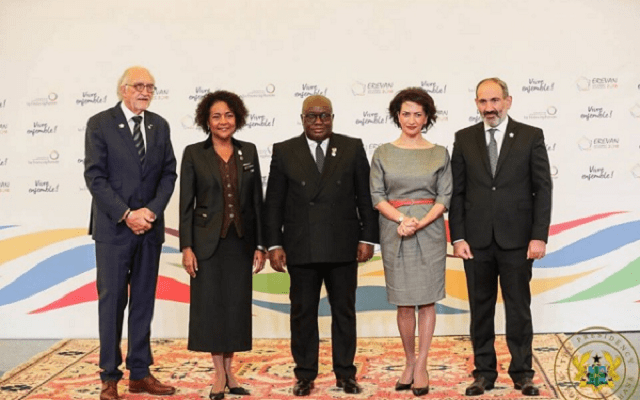 The President, who flew to Armenia from London where he attended the 5th Financial Times Summit, said in a speech that Ghana’s membership of La Francophonie should serve as a big boost to addressing some of the country’s mutual concerns. Stressing the importance of the French language globally, the President said it was set to become one of the world’s most commonly spoken languages. He said with the number of people who spoke French expected to rise to over 700 million, of which 80 per cent would be in Africa, the lives of Ghanaians were intimately linked with the francophone world. President Akufo-Addo addressed the summit in impeccable French and promised to promote the language in the country. Over the years, the Ghanaian government has implemented policies to promote the French language, they include; introducing French language in a number of professional and technical-oriented universities, providing resources in public libraries to enable learning of French with a degree of autonomy, the University of Ghana celebrating La Francophonie Day with seminars and conferences to create awareness of the language, and initiating talks with French TV stations to extend their broadcasting services to Ghana. One of the main reasons given by President Akufo-Addo’s government as to why French is a language of interest is the fact that the Republic of Ghana is surrounded by French-speaking countries and most ECOWAS countries have French as their official language. The government believes that the country will benefit more from the West African sub-region if French is taught in schools.